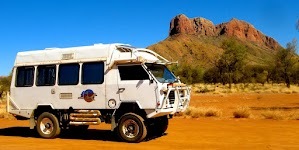 Our Oka has been left idle for the past couple of months since returning from our recent trek across the WA deserts. The spring bolt behind the gas bottle is protruding about 50mm whereas it should be flush with the chassis spring mount. The Nyloc nut on the inside of the bolt is still in place so it’s not rocket science to surmise that the bolt is broken in the middle, probably across the grease hole which would be its weakest point. Gouges on the side of the gas bottle suggests that the broken bolt was being held in place by the bottle, which is probably better than the bolt falling completely out, but it may have been this way, unnoticed, for quite some time which is a bit of a worry. 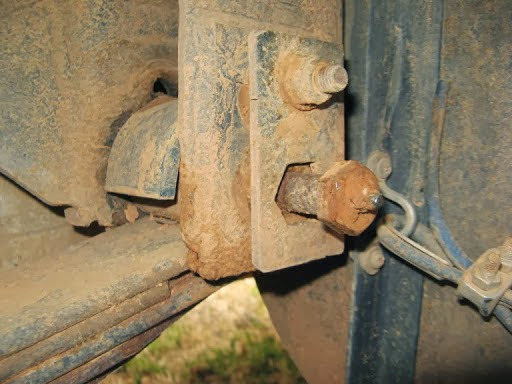 The really strange thing about this event is not that a spring bolt has broken, we’ve experienced a few of those before, but that all spring and tyre related problems have always been on the same wheel, the drivers side rear. That now makes 3 spring bolts, 2 broken springs, a bogging and a tyre staking all on the same corner. What are the chances of that happening? I don’t believe there is anything very different about this corner, the construction and loading is very similar to the opposite side. Replacing the bolt is not a major task, I have spares, it’s just a heavy job. The real questions are why and how to prevent future occurrences? 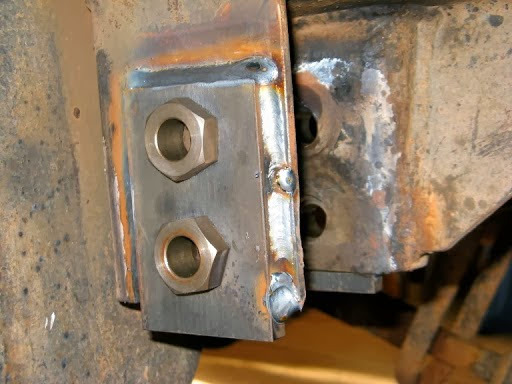 All other spring bolts apart from the 2 rears have been upgraded to 20mm diameter suspensions pins which are a lot stronger than the original 16mm bolts. 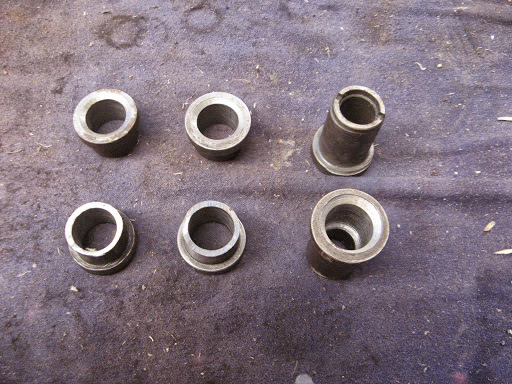 These 2 rear bolts had previously been replaced by ultra-strong crankshaft quality 16mm bolts, running in bespoke replaceable bushes, and were claimed to be unbreakable, until now. 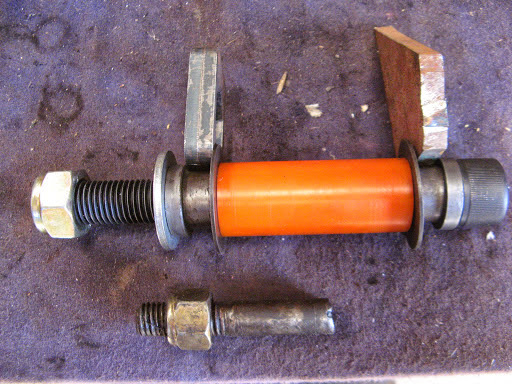 So I shall now upgrade the remaining 2 bolts to 20mm pins, which is not so easy (and the reason why they haven’t been done previously) since the chassis mounts were specifically designed for the replaceable bushes and I’ll have to redesign and reweld them to take 20mm pins. I was going to check and replace the urethane bushes anyway before our next trip. I might consider going up market further to the 25mm suspension pins as fitted to the new NT model, (actually the NT pins are 1 inch or 25.4mm diameter). However more thought would be required since the spring eyes are not much more than 25mm anyway, actually around 32mm, which means the wall thickness of the urethane bushes can only be between 3-4mm (the NT pins actually run in steel/phosphor bronze bushes which are only 3mm thick). The bolt replacement task is not a huge one and made all the better by the fault being discovered at home rather than on the side of some remote, hot, dusty, insect ridden track like previous similar events. Here I have the time, facilities, shelter and materials access to do it at my leisure, all I need is the motivation but they don’t sell that at Bunnings, I know, I asked once which aisle it was in. Since starting this article, I’ve replaced the rear suspension pins with high tensile 20mm bolts and fitted bushes to provide a larger surface area for their support. To do that I had to drill out the holes in both side plates to 25mm to accept the bushes, which would have been much easier if I had been able to turn the chassis on its side and use my large pedestal drill. As it was I had to buy a new larger power drill and go up in size progressively from 20 to 25mm. 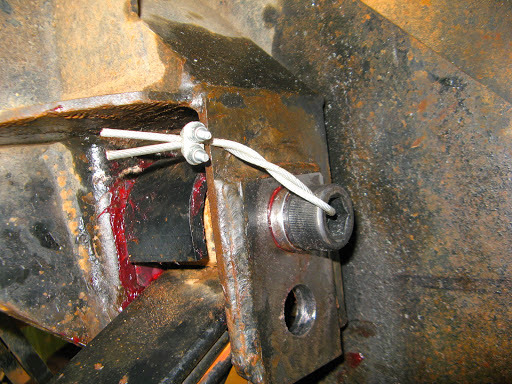 The bushes were fashioned from former Oka suspension bushes, cut to size and drilled out to 20mm to fit the new bolts. I also fitted new urethane bushes although the older softer versions weren’t as worn as I had expected. Because I could only get long enough Class 12.9 bolts in socket head versions I fitted a retaining and anti-rotation wire to their heads. Drilling HT steel is not easy and the 3mm drill bit crackled as it went though. Smaller drill sizes just snapped. For good measure I also drilled the threaded end to accept an R pin so the nyloc nut can’t ever come off. While I had the opportunity, I changed from the lower to upper bolt hole position. This lowers the suspension by around 30mm and allows the airbags to take more of the load levelling task. It also tilts the differential yoke upwards slightly taking some stresses off the UJ. 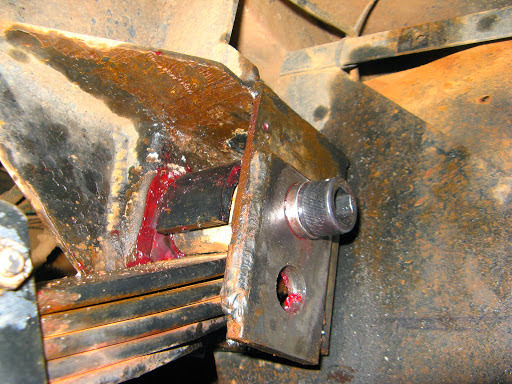 All 12 suspension bolts/pins on our Oka are now 20mm HT steel so we should have no more failures of this kind.